Episode 50 – The Decibel Boost One Year Anniversary Spectacular!! 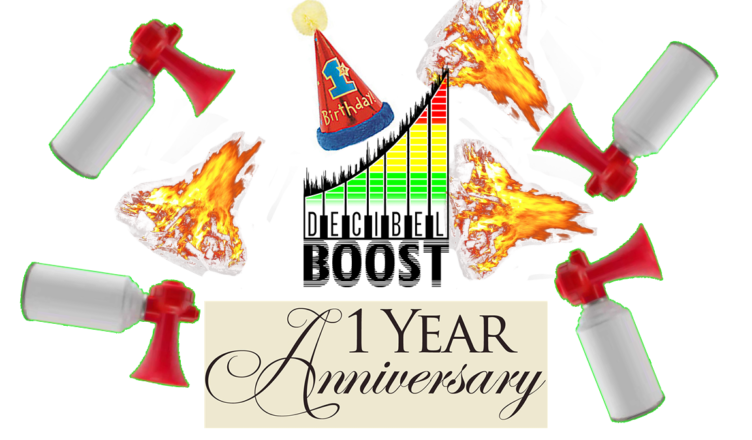 This week marks the 1 year anniversary of the Decibel Boost Podcast. A year of clever musical commentary, fanboyish obsessiveness, low-brow humor, epic roastings of Tyler, and really bad Fantano impressions! To celebrate, the crew discusses a bit about the behind-the-scenes of making this show every week before talking some of our favorite moments from the first year of the show. But before that, we discuss new singles from Frank Ocean, Taylor Swift (again… sorry), Yung Lean, IDK, Dyscarnate, Dan Terminus, Mastodon, Will Smith & DJ Jazzy Jeff, and more. In the news topics: Toni Basil is suing everyone, Taylor Swift takes the modern gaming industry’s approach to nickel-and-diming fans, and Metallica plans yet another stellar reissue of a classic album.